There was confusion in the Alapere area of Ketu on Sunday after the Divisional Crime Officer of Sagamu Road Police Division, Ikorodu, SP Opawoye Adetunji, allegedly shot a bus passenger. Officer Adetunji was said to have been attacked by a mob, who beat him to a pulp. The police officer was reportedly rushed to a hospital after he passed out. Punch gathered that the police officer and a commercial bus driver had had an argument at Iyana Ile-Iwe bus stop after the driver reportedly drove recklessly. After a fight, the man had entered his bus and was driving away when Adetunji allegedly opened fire on the vehicle, which hit the yet-to-be-identified passenger. A resident, who spoke on condition of anonymity, told Punch that the incident happened around 3pm, adding that the police officer was in mufti. A police source, however, told Punch that the driver had almost hit Adetunji when the latter challenged him. He said, “The police officer, who was alone, was driving on the road when his vehicle had a fault. He parked the car by the roadside to look for a mechanic to repair it. “As he attempted to cross to the other side of the road, a reckless commercial bus driver almost hit him. He stopped the bus and engaged the driver in an argument. He challenged the driver for being reckless and the man abused him for not looking well before crossing. “The argument degenerated into a fight as the driver picked a bottle. As he tried to smash it on the officer, the DCO used his hand to block it and got injured. The driver entered the bus and drove off. The Punch gathered that there was chaos as residents took the victim to a hospital where his condition was said to be critical. The police officer, who attempted to flee, was reportedly caught around Adedoyin Street, in the Kosofe area, where a mob beat him to a pulp. Adetunji, who sustained serious injuries, reportedly passed out before he was rescued by policemen from the Ketu division, who took him to an undisclosed hospital for treatment. The state Police Public Relations Officer, SP Chike Oti, confirmed the incident, adding that investigations were ongoing. Oti, who released a statement on the incident on Monday, said the state Commissioner of Police, Edgal Imohimi, had ordered that the officer be queried after coming round for misuse of his firearm. 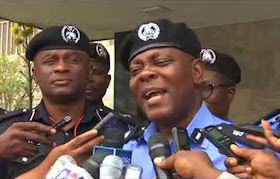 He said, “The Commissioner of Police, Lagos State, CP Edgal Imohimi, deeply regrets the unwarranted use of a firearm by a Superintendent of Police attached to the Sagamu Road Police Station as the Divisional Crime Officer, SP Opawoye Adetunji. “The CP has directed that the officer be issued a comprehensive query for shooting a civilian on Sunday, April 15, 2018, for a yet-to-be determined reason. The officer, who is currently recuperating in an undisclosed hospital alongside the victim, has not been able to make his statement because he is still unconscious as a result of the beating he received and injuries he sustained when the mob attacked him at the scene of the incident.